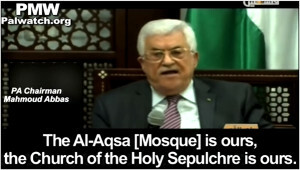 and defense of our occupied land"
PA and Fatah leaders say presence of Jews in Muslim holy places is "desecration" and "defilement"
The Palestinian Authority and Fatah constantly brainwash Palestinians with the libel that Israel is targeting the Islamic holy places, in particular the Al-Aqsa Mosque. Numerous PA and Fatah officials regularly warn Palestinians that Israel is planning to or is in the process of destroying the Al-Aqsa Mosque in order to build what Palestinians refer to as "the alleged Temple." Palestinian leaders state that Jews visiting the Temple Mount are "defiling" the Al-Aqsa Mosque and its plaza and that Israel is trying to "Judaize" Jerusalem with the goal of erasing any Arab and Islamic history in it. Palestinian leaders have called for Palestinians and other Muslims to come to "defend" and "protect" Al-Aqsa from this alleged "danger," describing the conflict as "Ribat" - religious conflict/war over land claimed to be Islamic. During the recent terror wave, some international leaders were quick to claim reasons for the Palestinian terror that fit their personal narrative regarding the causes of the conflict. Some claimed the terror was a response to “frustration” following lack of progress towards a solution, and some PA leaders expressed this explanation primarily to foreign audiences. But the internal Palestinian messaging was very different. Testimonies of Palestinians who participated in the terror indicate that the terrorists believed their leaders' lies, adopted them as truth, and were following the leadership’s instructions to "defend" and "protect" Jerusalem and the holy places, by killing Israelis, throughout Israel. 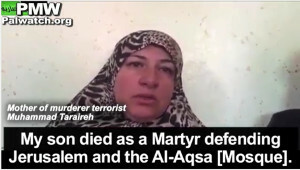 Mother of terrorist murderer Muhammad Taraireh: "My son is a hero. He made me proud. My son died as a Martyr defending Jerusalem and the Al-Aqsa Mosque. Praise be to Allah, Lord of the Worlds, he [my son] has joined the Martyrs before him, and he is not better than them. Allah willing, all of them will follow this path, all the youth of Palestine. Allah be praised." Fatah terrorist Bara Issa: "In the name of the All Merciful Allah... On behalf of myself and the Palestinian people, I, son of Jerusalem, Bara Kaid Faiq Issa... dedicate myself to the protection of the Al-Aqsa [Mosque] and defense of our occupied land, out of pure intention and for Allah... My brothers, young ones, Martyrdom is the highest level, and I urge you to follow the path of liberation and Martyrdom. Your brother [in faith] in Allah, Bara Issa, son of the Al-Aqsa Martyrs' Brigades, Fatah's military wing." PA Chairman Mahmoud Abbas: "We bless you, we bless the Murabitin (those carrying out Ribat, religious conflict/war to protect land claimed to be Islamic), we bless every drop of blood that has been spilled for Jerusalem, which is clean and pure blood, blood spilled for Allah, Allah willing. Every Martyr (Shahid) will reach Paradise, and everyone wounded will be rewarded by Allah. The Al-Aqsa [Mosque] is ours, the Church of the Holy Sepulchre is ours, and they have no right to defile them with their filthy feet. We will not allow them to, and we will do everything in our power to protect Jerusalem." "The president [Abbas] said that the party responsible for what is happening is the occupation, which has continued to desecrate our holy sites in Jerusalem, protects the settlers during their attacks against our people." The "warning" that Jews are "defiling" the Al-Aqsa Mosque and other holy sites is still being repeated continuously by Palestinian leaders. "[PA] Minister of Religious Affairs Yusuf Ida'is condemned... the continuation of the [occupation's] policy of distancing employees and guards [from the Al-Aqsa Mosque] and their arrest as an advanced step for the purpose of clearing the Al-Aqsa Mosque, imposing the Jewish presence there, and allowing the settlers to desecrate it freely." "Regarding Hebron, and particularly in the Ibrahimi Mosque (i.e., Cave of the Patriarchs), [PA Minister of Religious Affairs Yusuf] Ida'is clarified that the occupation authorities have highlighted the level of their arrogance and continued to defile the mosque." "Palestine is the gate of war and the gate of peace, and that Israel must understand that the reason for the violence and the incitement is the fact that it continues to steal our land, continues its colonialist plans, and persistently defiles the Al-Aqsa Mosque and the sites that are holy to Islam and Christianity." the settlers, their ongoing invasions, and their defilement of the site." "The PLO Department for Jerusalem Affairs condemned... the invasion of the blessed Al-Aqsa Mosque plaza by dozens of the herds of extremist settlers... they carried out tours of provocation at the mosque's plaza... [PLO Department also condemned] these racist terrorist organizations and their ongoing encouragement of settlers to invade the blessed Al-Aqsa Mosque plaza and defile it by holding Talmudic ceremonies by Jewish rabbis within it." "The Israeli occupation authorities and its institutions are trying to create facts on the ground at the blessed Al-Aqsa Mosque, in preparation for falsifying the nature of the site and establishing the alleged Temple in its place." When instructing Palestinians to "defend" and "protect" the holy places, Palestinian leaders continuously use terms like "whatever the cost," "no matter the price," and "no matter what sacrifices" - all terms that implicitly include the acceptability of using violence and terror. In addition, when PA and Fatah leaders describe Jerusalem and all of Israel they use the term "the land of Ribat" - holy Islamic land - whose "liberation" and "defense" are said to be mandatory under Islamic law. Palestinians defending the holy sites thereby become "Murabitin" - Ribat fighters. Palestinian Media Watch has documented the frequent Palestinian description of the conflict with Israel as one of Ribat. The act of carrying out Ribat can include use of violence as well as non-violent means, such as praying in the Al-Aqsa Mosque. "Grand Mufti of Jerusalem Sheikh Hussein said: 'The invasion of the blessed Al-Aqsa Mosque plaza by occupation forces, their attack on those worshipping at it, and their aggression against those guarding it, teachers of the law, and those working in its environs, are nothing but an expression of aggressive policy and Zionist intransigence against the blessed Al-Aqsa Mosque and its visitors.' He added that this stage is very dangerous, and warned of the consequences of these violations that offend Muslim sensibilities throughout the world. He called on our people to come out against these violations, whatever the price may be, and clarified that only Muslims have a right to the Al-Aqsa Mosque." This statement was said just a few days before terrorist Taraireh murdered the 13-year-old Israeli girl in her sleep. "He [the Grand Mufti] called to everyone who can to come to the Al-Aqsa Mosque to invest every effort in order to visit it and strengthen the presence there in order to defend it, and emphasized the adherence of our people to their mosque, regardless of the cost and sacrifices required, until Allah inherits the land and everything in it." "All of the occupation's attempts to take over the Al-Aqsa Mosque and to try to falsify or change its history will not succeed, whatever the cost may be." "The president addressed the importance of the great role of the guards of the Al-Aqsa Mosque in defending our holy sites, and emphasized the importance of the firm stand on our land against the occupation, no matter what arbitrary steps and violations it makes. The president clarified that our people is carrying out Ribat and defending Jerusalem and the holy sites, and [said] that: 'The blessed Al-Aqsa Mosque is a red line, we will not allow it to be violated.'" "During its weekly meeting, held yesterday [July 12, 2016] in Ramallah led by [PA] Prime Minister Rami Hamdallah, the [PA] government ... called on our people and everyone who can to come to the Al-Aqsa Mosque in order to carry out Ribat and to pray there at all times, in order to protect it from the settlers and their incessant invasions." "... our people will continue to carry out unceasing Ribat at the Al-Aqsa Mosque... and will continue to be rooted in its Al-Aqsa Mosque and the rest of its land until the occupation passes." "...he called to come and carry out Ribat (i.e., religious conflict/war over land claimed to be Islamic) at the Al-Aqsa Mosque plazas in the coming days, particularly in light of the calls of the Jewish groups to invade the Al-Aqsa Mosque on the anniversary of what is called the destruction of the Temple (i.e., Tisha B'Av)." "The Palestinian National Freedom Movement Fatah called to go to the blessed Al-Aqsa Mosque and carry out Ribat there, especially these days when the occupation (i.e., Israeli) government is trying to create a new fact on the ground: Permitting settlers to enter the Al-Aqsa Mosque plaza during Ramadan... Official Fatah Spokesman in occupied Jerusalem Raafat Alayan... emphasized that stopping the settlers' invasions is a religious and national command and duty. Likewise, Alayan demanded that all Muslims of all nations come to the Al-Aqsa Mosque and emphasized that the Al-Aqsa Mosque is in real danger, so that every Muslim in the world must protect it by visiting it and praying at it... Alayan concluded by saying that the [Fatah] Movement will continue to defend Jerusalem and the Al-Aqsa Mosque in all ways and by all means, and that resistance to the Israeli occupation is a national and religious duty." Mother of terrorist Muhammad Taraireh: "My son is a hero. He made me proud. My son died as a Martyr defending Jerusalem and the Al-Aqsa [Mosque]. Praise be to Allah, Lord of the Worlds, he [my son] has joined the Martyrs before him, and he is not better than them. Allah willing, all of them will follow this path, all the youth of Palestine. Allah be praised." Muhammad Taraireh - 17-year-old Palestinian terrorist, who stabbed and murdered 13-year-old American Israeli Hallel Yaffa Ariel, as she slept in her bed, in her home in Kiryat Arba near Hebron, on June 30, 2016. Taraireh also injured one of the Israeli security personnel before he was shot and killed. Official PA TV host: "It is clear that the small hopes of this child are connected to the blessed Al-Aqsa Mosque." The PA and its leaders consider all of the Temple Mount an integral part of the Al-Aqsa Mosque. Therefore they view any presence of Jews on the mount as an "invasion." Note: Jews who visit the Temple Mount only enter some sections of the open areas, and do not enter the Al-Aqsa Mosque or the Dome of the Rock. Stabbing attack at a light rail stop in Pisgat Ze'ev - Two Palestinian terrorists, Muawiyah and Ali Alqam, aged 14 and 11, stabbed and wounded an Israeli security guard at a Jerusalem light rail stop in the Pisgat Ze'ev neighborhood, on Nov. 10, 2015. The security guard shot and wounded the 14-year-old stabber and the second terrorist was held by passengers until security forces arrived. In July 2016, Muawiyah Alqam was sentenced to 6.5 years in prison. Farewell video - Recorded declaration of Bara Issa, who stabbed and injured an Israeli man in Sha'ar Binyamin, north of Jerusalem, on Nov. 6, 2015. In the background huge Fatah logos. 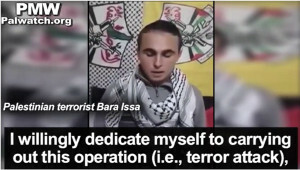 Palestinian terrorist Bara Issa: "In the name of the All Merciful Allah. Allah said: 'And never think of those who have been killed in the cause of Allah as dead. Rather, they are alive with their Lord, receiving provision' (Quran, Sura 3:169). On behalf of myself and the Palestinian people, I, son of Jerusalem, Bara Kaid Faiq Issa, [Israeli] I.D. 40630297, dedicate myself to the protection of the Al-Aqsa [Mosque] and defense of our occupied land, out of pure intention and for Allah, and [as] a decisive response to our noble women who cry out: 'Islam, save us!' And being at my full mental and physical capacity, I willingly dedicate myself to carrying out this operation (i.e., terror attack), without any party guiding me or pressuring me. My brothers, young ones, Martyrdom is the highest level, and I urge you to follow the path of liberation and Martyrdom. Your brother [in faith] in Allah, Bara Issa, son of the Al-Aqsa Martyrs' Brigades, Fatah's military wing. Peace be upon you, and Allah's mercy and blessing." Bara Issa- Palestinian terrorist who stabbed an Israeli man near the Rami Levy supermarket in Sha'ar Binyamin, north of Jerusalem, on Nov. 6, 2015. On the day of the attack (probably before he carried it out), he posted a video taking credit for it. On Nov. 7, PA authorities claimed that Issa had turned himself in to their security forces. PMW has been unable to verify this. "Grand Mufti of Jerusalem and the Palestinian Territories and preacher at the blessed Al-Aqsa Mosque Sheikh Muhammad Hussein called on everyone who can to come to occupied Jerusalem and the blessed Al-Aqsa Mosque, and to go to them in order to stand up to the Israeli occupation that is doing as it pleases with Jerusalem and attacks those worshipping at [the Al-Aqsa Mosque]. Sheikh Hussein said: 'The invasion of the blessed Al-Aqsa Mosque plaza by occupation forces, their attack on those worshipping at it, and their aggression against those guarding it, teachers of the law, and those working in its environs, are nothing but an expression of aggressive policy and Zionist intransigence against the blessed Al-Aqsa Mosque and its visitors.' He added that this stage is very dangerous, and warned of the consequences of these violations that offend Muslim sensibilities throughout the world. He called on our people to come out against these violations, whatever the price may be, and clarified that only Muslims have a right to the Al-Aqsa Mosque." Headline: "[PA] Grand Mufti [Sheikh Muhammad Hussein] condemned the holding of a Jewish memorial service at the Al-Aqsa Mosque plaza"
The mufti said: 'This criminal attack against the sanctity of the blessed Al-Aqsa Mosque is nothing but one link in the chain of ongoing escalation, in preparation for imposing the division of the Al-Aqsa Mosque by areas and times, and it is part of a process to change its existing historical status.' ...Likewise, he called to everyone who can to come to the Al-Aqsa Mosque to invest every effort in order to visit it and strengthen the presence there in order to defend it, and emphasized the adherence of our people to their mosque, regardless of the cost and sacrifices required, until Allah inherits the land and everything in it." "Division according to areas and times" refers to a proposed law (May 2013) being reviewed in Israeli Parliament that would allow for both Jews and Muslims to pray on the Temple Mount, what the Palestinians call the Al-Aqsa Mosque plaza. The law seeks to designate separate prayer times and areas of the site for Muslims and Jews. However, Israeli PM Netanyahu has stated on many occasions that the Israeli government has no intention of changing the status quo on the Temple Mount, which means Jews are allowed to enter the Temple Mount, but cannot pray there or engage in any type of worship. The two emphasized that the dangerous Israeli plots against Jerusalem - that are increasing and are expressed in the continuation of their attempts to interfere in the matters of Jerusalem's Noble Sanctuary (i.e., Temple Mount), with intensive excavations under the Al-Aqsa Mosque under the pretext of searching for alleged remains, and in the widespread settlement plans in Jerusalem - are nothing but an attempt to change the status quo at Jerusalem's Noble Sanctuary." Headline: "The Department for Jerusalem Affairs warned of the calls of extremist Jewish organizations to invade the Al-Aqsa Mosque"
"The PLO Department for Jerusalem Affairs warned of the dangers and consequences of the ongoing racist calls of extremist Jewish organizations who called to carry out a widespread invasion of the blessed Al-Aqsa Mosque, accompanied by the greatest rabbis of the settlers, in order to carry out Talmudic (i.e., Jewish) ceremonies in the pure Al-Aqsa Mosque plazas. The department condemned in a press release today, Tuesday [July 26, 2016], the invasion of the blessed Al-Aqsa Mosque plaza by dozens of the herds of extremist settlers from the direction of the Mughrabi Gate, under the heightened protection of the occupation police and its special forces, and the fact that they carried out tours of provocation at the mosque's plaza in order to take pictures. This was done through response to the calls of these racist terrorist organizations and their ongoing encouragement of settlers to invade the blessed Al-Aqsa Mosque plaza and defile it by holding Talmudic ceremonies by Jewish rabbis within it." Headline: "The [PLO] Department for Jerusalem Affairs criticized the dangerous racist calls of the [Jewish] 'Temple' organizations to invade the Al-Aqsa Mosque"
The PLO Department for Jerusalem Affairs called on our people and everyone who can to come to the Al-Aqsa Mosque and carry out Ribat (i.e., religious conflict/war over land claimed to be Islamic) and pray there all the time, in order to defend it from the crimes of the settlers, their ongoing invasions, and their defilement of the site." "Alleged Temple organizations" refer to religious Jewish movements including the Temple Mount Heritage Foundation, The Initiative for Jewish Freedom on the Temple Mount and Students for the Temple Mount, which spread awareness of the importance of the Temple Mount in Judaism and encourage people to visit the site. Headline: "[PA Chairman Mahmoud Abbas' Advisor Mahmoud] Al-Habbash warns: Israel is striving for a bloodbath at the Al-Aqsa Mosque"
"Supreme Shari'ah Judge of Palestine and [PA] President [Mahmoud Abbas'] Advisor on Religious and Islamic Affairs [and Chairman of the Supreme Council for Shari'ah Justice] Mahmoud Al-Habbash warned today, Monday [June 27, 2016], of the planned Israeli intentions to blow up the situation at the blessed Al-Aqsa Mosque in order to cause bloodshed, which will enable justifying Israeli steps at the Al-Aqsa Mosque that will lead to taking control over part of it for the occupation, as happened at the Ibrahimi Mosque (i.e., Cave of the Patriarchs) in Hebron. Al-Habbash said that the invasion today and yesterday of the Al-Aqsa Mosque plaza and the locking of the Southern Mosque (i.e., the Al-Aqsa Mosque itself as opposed to the plaza) with heavy chains by the Israeli occupation police and army, on the orders of the occupation government's Prime Minister Benjamin Netanyahu, constitute organized state terror. He noted that the ongoing escalation, the consecutive invasions of the Al-Aqsa Mosque plaza and the attempt to spill the blood of the worshippers clearly exposes without a shadow of a doubt the planned Israeli intentions to create facts on the ground, on the way to a division of the Al-Aqsa Mosque plaza according to areas and times." Cave of the Patriarchs massacre - On Feb. 25, 1994, Baruch Goldstein, a member of an Israeli far-right movement, opened fire on Muslims praying inside the Cave of the Patriarchs in Hebron, known to Muslims as the "Ibrahimi Mosque," killing 29 and wounding 125. Following the attack, which was widely condemned by Israeli leaders and Jewish communities abroad, the Israeli government took concrete steps to prevent similar attacks from occurring by dividing the area of worship into Muslim and Jewish sections and designating several extremist movements, including Goldstein's, as illegal terrorist groups. Headline: "[PA] President [Mahmoud Abbas]: Al-Aqsa Mosque is a red line, we will not allow it to be violated." "[PA] President Mahmoud Abbas emphasized the need to stop the violations at the blessed Al-Aqsa Mosque, and emphasized that it is a red line, and that it is impossible to remain silent in light of the daily attacks and violations befalling it from the occupation and its settlers. These statements were said during a reception that the president held yesterday evening [June 12, 2016] at the presidential headquarters in Ramallah for guards of the blessed Al-Aqsa Mosque who were distanced by the occupation forces, attended by Fatah Secretary in Jerusalem Adnan Ghaith. The president addressed the importance of the great role of the guards of the Al-Aqsa Mosque in defending our holy sites, and emphasized the importance of the firm stand on our land against the occupation, no matter what arbitrary steps and violations it makes. The president clarified that our people is carrying out Ribat (i.e., religious conflict/war over land claimed to be Islamic) and defending Jerusalem and the holy sites, and [said] that: 'The blessed Al-Aqsa Mosque is a red line, we will not allow it to be violated.'" "[PA] President [Mahmoud Abbas] met last night [Oct. 11, 2015] with the [Fatah] branch secretaries and representatives of the Fatah Shabiba movement in the northern districts of the homeland (i.e., the West Bank). He updated them on the latest political developments, and expressed appreciation for their efforts to establish the Palestinian cause as the central cause in the region which needs to be the first priority of the international community. The president said that the party responsible for what is happening is the occupation, which has continued to desecrate our holy sites in Jerusalem, protects the settlers during their attacks against our people, and evades fulfilling its obligations according to agreements signed between the two sides until a permanent solution [is reached]. He added that the Israeli government sets loose the settlers who attack our holy sites and our people, block the roads, and burn the crops. The president emphasized that the Fatah Movement will remain the spine of the Palestinian revolution, will continue to lead the struggle to freedom through popular peaceful resistance, and will continue to adhere to the national principles, first among them the establishment of our independent Palestinian state with East Jerusalem as its capital... [In] a phone call with European Union Foreign Minister Federica Mogherini... he [Abbas] emphasized that continued settlers' provocations in the blessed Al-Aqsa Mosque will lead to disastrous results." Headline: "Fatah: Stopping the invasions of the Al-Aqsa Mosque is a religious command and duty"
Alayan concluded by saying that the [Fatah] Movement will continue to defend Jerusalem and the Al-Aqsa Mosque in all ways and by all means, and that resistance to the Israeli occupation is a national and religious duty." Headline: "Anastas: Israel's claims regarding the thwarting of the resolution regarding Jerusalem in the Heritage Committee are false"
Palestinian Commissioner in the United Nations Educational, Scientific and Cultural Organization (UNESCO) [Anastas] gave thanks for the support of the EU states and all the member states for the proposal submitted by the Arab bloc which protects the use of the name 'Al-Aqsa Mosque / Jerusalem Noble Sanctuary' (i.e., Temple Mount) as synonymous names. He demanded that Israel not change the status quo that determines that the Al-Aqsa Mosque / Jerusalem Noble Sanctuary is an Islamic holy site intended for Muslim worship alone, [and said that] the occupation authorities must put an end to the invasions by [Israeli] soldiers or Israeli extremists, as this behavior constitutes a violation that defiles the sanctity and authentic character of the Al-Aqsa Mosque/Jerusalem Noble Sanctuary." Headline: "Fatah: Our holy sites are a red line, and we will not allow them to be Judaized, the world must bear responsibility for the consequences"
"The Fatah Movement emphasized that the Al-Aqsa Mosque and the sites holy to Islam and Christianity are red lines and the settlers cannot ever be allowed to harm them. Al-Qawasmi said that the attempts of the occupation state to Judaize East Jerusalem and the Al-Aqsa Mosque constitute contempt for the international community and its laws. Likewise, he emphasized Fatah's opposition to the occupation's efforts to turn the invasions into a fait accompli, and recalled the Jerusalem uprising (i.e., several months of Palestinian terror attacks against Israelis 2015 - 2016) that came in order to express the opposition of the Palestinian people and its leadership to the harm to the sites holy to the Palestinian people. Fatah demanded that the Arab and Muslim states fulfill their responsibilities, exert active pressure, and [demanded them] to speak in terms of interests with the world nations in order to pressure the occupation state, and it warned against ignoring the dangers and the bad and ominous consequences of the Judaization of the Al-Aqsa Mosque." Palestinian terror wave (2015-2016) - Palestinian violence and terror attacks against Israelis, including stabbings, shootings, throwing Molotov cocktails, and car rammings. It started in September 2015 and as of Aug. 11, 2016, Palestinian terrorists murdered 40 people (36 Israelis, 1 Palestinian, 2 Americans, and 1 foreign worker from Eritrea) and injured over 500. Headline: "The [PA] government emphasizes the leadership's position on the matter of the Quartet report"
It condemned the racist calls of the alleged Temple organizations and the daily invasions of the blessed Al-Aqsa Mosque plaza that are welcomed and encouraged by the occupation government, which provides backing and protection to the activities of these extreme organizations and associations. Likewise, it demanded of the international community that it apply pressure to the occupation government which ignores all of the international laws and conventions when it prevents the arrival of Muslims at the Al-Aqsa Mosque in order to pray, attacks women and distances them from the Al-Aqsa Mosque, hits the Murabitin (those carrying out Ribat, religious conflict/war to protect land claimed to be Islamic -Ed.) at the Al-Aqsa Mosque plaza and uses weapons against them, and incites settler organizations to invade it. The [PA] government called on our people and everyone who can to come to the Al-Aqsa Mosque in order to carry out Ribat and to pray there at all times, in order to protect it from the settlers and their incessant invasions." The Quartet also gave a number of recommendations. Headline: "Israel is playing with fire: 35 injured at the Al-Aqsa Mosque plaza"
"[PA] Government Spokesman Yusuf Al-Mahmoud warned yesterday [June 27, 2016] of the consequences of the occupation's (i.e., Israel's) ongoing aggression against the Al-Aqsa Mosque and those praying there during these blessed days of the month of Ramadan. He emphasized: 'The Al-Aqsa Mosque, everything within its walls, and everything attached to it from outside, is an Islamic mosque that belongs to the Palestinians who reside in the land and to all Arabs and Muslims according to the historical facts, the natural situation, and the international consensus.'" "[Official] Fatah Spokesman in occupied Jerusalem Raafat Alayan emphasized that the fact that not less than 400,000 worshippers came to the Friday prayers to mark The Night of Decree (i.e., when the first verses of the Quran were revealed to Muhammad), despite the racist separation fence and the occupation's (i.e., Israel's) steps, constitutes additional proof of the failure of the Israeli occupation in isolating Jerusalem or of its attempts to annex it. He added that all of the occupation's attempts to take over the Al-Aqsa Mosque and to try to falsify or change its history will not succeed, whatever the cost may be, and emphasized the need to continue to visit the blessed Al-Aqsa Mosque every day of the year." Headline: "The Islamic-Christian Council: The distancing of guards and employees of the Al-Aqsa Mosque [from the mosque] is a racist policy whose goal is to empty it"
Secretary-General of the Council Hanna Issa addressed the Israeli extremism, which is expressed in determining facts on the ground by Judaizing the Al-Aqsa Mosque and turning it into a synagogue, ahead of the establishment of the alleged Temple on its ruins. He noted that the Judaization plan and steps at the Jerusalem Noble Sanctuary (i.e., the Temple Mount) are gaining momentum, as if the Israeli occupation state - with the help of its settlers and extremists - is in a race against time to realize the Jewish dream: the establishment of the Temple as soon as possible." Headline: "Ida'is condemned the Israeli attacks against the Al-Aqsa Mosque and its guards"
Likewise, he noted that as is its habit, the occupation is intentionally working to clear the Al-Aqsa Mosque plazas and [remove] those carrying out Ribat (i.e., religious conflict/war over land claimed to be Islamic) within it, and to prevent them from entering it, and it is punishing them by all possible means. He emphasized that our people will continue to carry out unceasing Ribat at the Al-Aqsa Mosque... and will continue to be rooted in its Al-Aqsa Mosque and the rest of its land until the occupation passes." Headline: "Al-Husseini: The peace begins from Jerusalem"
He said: 'The matter is very dangerous and requires the constant presence of the Murabitin (i.e., those carrying out Ribat, religious conflict/war to protect land claimed to be Islamic) at the Al-Aqsa Mosque.'" Tisha B'Av is a Jewish day of mourning commemorating the destruction of the First and Second Temples in Jerusalem (586 BCE and 70 CE) and the forced exile of most of the Jewish people from the land of Israel. Regarding Hebron, and particularly in the Ibrahimi Mosque (i.e., Cave of the Patriarchs), Ida'is clarified that the occupation authorities have highlighted the level of their arrogance and continued to defile the mosque with a tour held by the one called the deputy director of the civil administration (i.e., Deputy Director of the Israeli Civil Administration Col. Uri Mendes and another officer from his department." 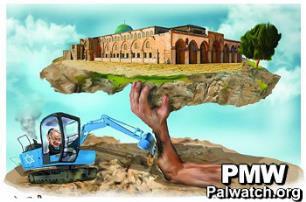 The PA and its leaders consider the Cave of the Patriarchs to be a Muslim religious site with no connection to Jews. Therefore they view any presence of Jews there as an "attack." "[PA] Minister of Jerusalem Affairs Adnan Al-Husseini... called on the city's people to show solidarity and to help the Al-Aqsa Mosque's [Jordanian Waqf] guards and employees, particularly at this stage in which they are subjected to arrest and distancing [from the mosque by the occupation]. Likewise, he called to come and carry out Ribat (i.e., religious conflict/war over land claimed to be Islamic) at the Al-Aqsa Mosque plazas in the coming days, particularly in light of the calls of the Jewish groups to invade the Al-Aqsa Mosque on the anniversary of what is called the destruction of the Temple (i.e., Tisha B'Av)." Headline: "Abu Al-Einein: Palestine is the gate of peace and war"
"[Advisor to PA Chairman Mahmoud Abbas on NGOs and] Fatah Central Committee member Sultan Abu Al-Einein said that Palestine is the gate of peace and the gate of war, and that we are peaceful, but our peace will only come about after the withdrawal of the occupation from our land. These comments were made during a reception that he held for a delegation of the Murabitin Council (i.e., council of those carrying out Ribat, religious conflict/war to protect land claimed to be Islamic) in Jerusalem, which held a solidarity visit with Abu Al-Einein in light of the occupation's steps against him and the ongoing incitement campaign by Tel Aviv in response to his positions that support the struggle of our people against the occupation (PMW exposed that Al-Einein said a Palestinian who meets an Israeli should "cut off his head" -Ed.). He concluded by saying that Palestine is the gate of war and the gate of peace, and that Israel must understand that the reason for the violence and the incitement is the fact that it continues to steal our land, continues its colonialist plans, and persistently defiles the Al-Aqsa Mosque and the sites that are holy to Islam and Christianity." PA leaders and officials have legitimized Palestinian violence by quoting UN resolution 3236 which "recognizes the right of the Palestinian people to regain its rights by all means." The PA interprets "all means" as including violence against civilians, but has chosen to ignore the continuation of the resolution which states that the use of "all means" should be "in accordance with the purposes and principles of the Charter of the United Nations..." The UN Charter prohibits targeting civilians, even in war. Chapter 1, Article 1, opens by saying that "international disputes" should be resolved "by peaceful means." Headline: "Minister of Religious Affairs: Israel is misleading the world on everything concerning the Al-Aqsa Mosque and Jerusalem"
"[PA] Minister of Religious Affairs Yusuf Ida'is described the policy of the occupation government and its steps at the blessed Al-Aqsa Mosque as 'malicious.' He warned that its [Israel's] goal is to harm the Al-Aqsa Mosque and establish the alleged Temple in its place. Ida'is said yesterday (Tuesday) [Aug. 2, 2016] in an interview with Radio Mawtini: 'The Israeli occupation authorities and its institutions are trying to create facts on the ground at the blessed Al-Aqsa Mosque, in preparation for falsifying the nature of the site and establishing the alleged Temple in its place.'" "Official [PA] Government Spokesman Yusuf Al-Mahmoud... called on the international institutions and the international community to get involved urgently in order to restrain the occupation and to stop its daily attacks against the blessed Al-Aqsa Mosque and against the occupied city of Jerusalem, through the desecration of the mosque whether by the daily invasions carried out by the herds of settlers under the protection of the occupation forces, or by the ongoing invasions by members of the occupation (i.e., Israeli policemen, border policemen, and soldiers) during which the worshippers within the mosque (the Al-Aqsa Mosque plaza, Israeli forces refrain from entering the mosque except in extreme circumstances -Ed.) are attacked." "[PA] Minister of Religious Affairs Yusuf Ida'is condemned the fact that the occupation forces arrested the [Jordanian] Waqf's Al-Aqsa Mosque Restoration Committee Director [Bassam Al-Hallaq] and three employees of the committee, as well as the continuation of the policy of distancing employees and guards [from the Al-Aqsa Mosque] and their arrest as an advanced step for the purpose of clearing the Al-Aqsa Mosque, imposing the Jewish presence there, and allowing the settlers to desecrate it freely." Headline: "Mattour warns: The occupation's scheme is being carried out in gradual steps for the purpose of dividing the Al-Aqsa Mosque and taking complete control of it"
"Deputy Secretary of the Fatah Movement in Jerusalem Shadi Mattour said that the steps of the occupation forces at the blessed Al-Aqsa Mosque, the arrests of its employees, and the stopping of the restoration activities at the Dome of the Rock constitute a Zionist scheme to divide the Al-Aqsa Mosque and to take control of it through gradual daily steps. He warned the Islamic and Arab states of the danger of these gradual steps, as after them will come complete Zionist control over the Al-Aqsa Mosque in order to divide it, and afterwards to destroy it so as to build the alleged Temple in its place." Headline: "The [PA] government: The occupation's crazy attack against the Al-Aqsa Mosque should be condemned and contradicts all laws"
"Official [PA] Government Spokesman Yusuf Al-Mahmoud condemned in a press release the ongoing invasions of the blessed Al-Aqsa Mosque by the occupation forces, which took place during the day at the same time as the invasion of the Dome of the Rock by an Israeli antiquities expert and [Israeli police] riot forces in order to examine the maintenance and restoration activities being carried out by the [Jordanian] Islamic Waqf department, and which were stopped by force several days ago. Al-Mahmoud stated: 'This attack comes as part of the daily attacks, invasions, and defilement of the Noble Sanctuary (i.e., Temple Mount), one of the holiest sites for Muslims, being perpetrated by the occupation forces in order to turn them into a fact on the ground in accordance with the dictates of the occupation mentality, and as part of the planting of the illusions and legends that it fabricates about the Al-Aqsa Mosque."